Most formatting of tables is done using the various format menus available in the Display or Design View but not available in Print Preview. 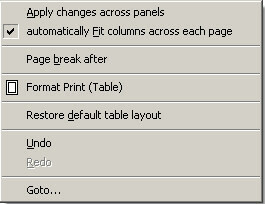 Select ‘Undo’ to reverse a single action. If you just want to restore the table to its system default format then select "Restore default table layout".